Kristin Laconi, brought her son, Jacob, 11, to Pinnacle after he showed off the "trick" he could do with his shoulder. Jacob is a typical active pre-teen who plays basketball and golf. Presumably, as a result of playing those sports, his shoulder began to pop out of place...thus the "trick." Pinnacle Senior Partner, Dr. Paul Payne examined Jacob and determined that he had a subluxation or a partially dislocated shoulder. 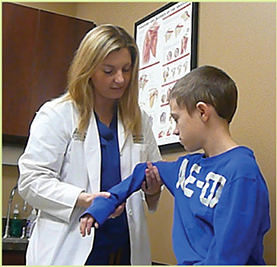 Dr. Payne understood Jacob's dedication to his sports, so he instructed him to just discontinue any specific activities that made his shoulder pop out of place. For now, sports would be allowed provided that Jacob began a series of strengthening exercises. Jacob needed to build up the muscle within the socket so that it would not slide out. Dr. Payne and I agreed that surgery would be a last resort and we set a plan and a goal to avoid surgery. Jacob did the muscle strengthening activities at home using resistance bands and later began physical therapy, while also continuing with the bands. 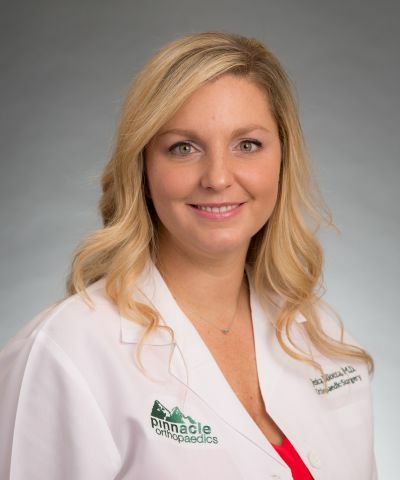 After four weeks of physical therapy, Dr. Payne referred him to Dr. Jessica Bilotta (who is a sports medicine specialist with a fellowship in Sports Medicine.) She had seen Jacob briefly the first day with Dr. Payne and was familiar with the original severity of the injury. Dr. Bilotta examined Jacob and noted significant progress, but that his shoulder was still able to slide out, although not as easily. She advised Jacob to continue therapy with some more aggressive elements added. Dr. Bilotta explained to him that the progress so far is promising and with continued hard work she is confident that full recovery without surgery is a good possibility. Mrs. Laconi says she appreciates Pinnacle and stated that "the doctors and the therapists treated Jacob like an adult in the sense of not trying to talk over his head or act like he wasn't in the room. They explained things to both of us very clearly, while at the same time were mindful that he is only 11 and knew that sports were very important to him. They were very respectful to us." "They explained things to both of us very clearly, while at the same time were mindful that he is only 11 and knew that sports were very important to him."